Germinating and bagging Trees for Planting. What all is involved in a Tree Nursery? Seeds for commercial species are purchased. Seeds for native trees need to be collected from the wild. The substrate or soil used in the planting bags is deposited close to the nursery and sterilized. Workers then start to fill planting bags or plastic reusable planting tubes with the substrate. Some seeds require pre-germinative treatment, which might involve immersion in hot water for 1 minute, followed by soaking in room temperature water for 24 hours. Others may need to have the germinating point of the seed sanded to increase the number of successful germinations. Most seeds are germinated in planting tables, basically boxed in areas with local soil in which the seeds are allowed to sprout. This is done to lower the incidence of non-germinating seeds in planting bags, which would be costly. Once sprouted, the seedling is transferred to a planting bag or planting tube. Various eras are germinated over time, so that planting in the field can also be staggered over a period of weeks. The seedlings are looked after in the tree nursery, until they are deemed big enough to transplant in the selected planting area or lot. What happens after the Tree Nursery? Our forestry technicians select a site based on a tree's preferences for type of soil, soil humidity, soil drainage or other factors, after which they then lay out a grid. As a rule, commercial species are planted in grids of 3 X 2.8 meters (10 X 9 feet)resulting in 1,250 trees per hectare (2.47 acres), while native trees are planted in grids of 3 X 3 meters (10 X 10 feet), resulting in 1,100 trees per hectare. Before planting, we prepare the soil, which involves cultivating the surface to eliminate the weeds, then deep ploughing to 60 cm (2 feet) of depth, which breaks the surface tension and allows the trees to develop deep roots quickly. Depending on the species, agricultural lime or calcium may be added to the soil no less than 2 weeks before planting, to assist the trees in developing their woody biomass cells, and in some soils to bind and neutralize undesirable aluminium. 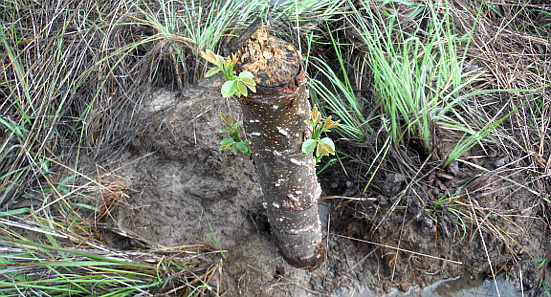 Most tropical trees are adapted to acidic soils, so it is generally not true that forestry soils are limed to lower soil acidity and raise the pH. During planting or shortly after, the trees are fertilized with organic material like compost or bokashi. Some species, like Caribbean Pine, need mycorrhizal fungi to be added in the nursery, as the fungi assist the tree in obtaining nutrients. Planting tubes are great, because they generate less waste and can be reused for many years. However, they are not suitable for all species, They also offer a much shorter planting window than do planting bags, as they have less substrate and lose more humidity, so one has to be well organized. Not all trees need to be planted using seeds. Quite often they can be propagated using cuttings, usually taken from a donor tree during the waning moon and then placed either vertically or diagonally in the soil, where the cutting will develop roots and shoots with new leaves. Examples are Gliricidia sepium or our native Licania heteromorpha, both used for living fences.